Donald Trump escalated his feud with ex-CIA chief John Brennan, who has been critical of Trump. Trump has just symbolically stripped Brennan of his security clearance, but this has sparked more criticism of Trump, with claims that Trump is trying to punish people who criticise him and warn off others. Former CIA Director John Brennan said on Wednesday that U.S. President Donald Trump’s decision to revoke his security clearance was part of an effort to silence critics. In an interview on MSNBC, Brennan said Trump’s action, announced on Wednesday by the White House, was politically motivated. It is remarkable to see a president promoting a statement like “An incredibly corrupt FBI & DOJ “. But there has been pushback against Trump’s attacks. In a remarkable rebuke to President Trump, 13 former U.S. intelligence chiefs have signed a harshly worded letter in support of former CIA Director John Brennan after Trump abruptly revoked his security clearance. “We feel compelled to respond in the wake of the ill-considered and unprecedented remarks and actions by the White House,” reads the letter from the officials, who served both Democratic and Republican presidents. They called Trump’s action “inappropriate” and “deeply regrettable.”Signing the letter Thursday was a virtual who’s who of American spy chiefs dating back to the late 1980s, a striking show of solidarity from the top ranks of the national security establishment. They included former directors of central intelligence William Webster, George Tenet and Porter Goss; former CIA directors Michael Hayden, Leon Panetta and David Petraeus; former Director of National Intelligence James Clapper; and former deputy CIA directors John McLaughlin, Stephen Kappes, Avril Haines, David Cohen and Michael Morell. Robert Gates, the former CIA director and secretary of Defense, signed on to the letter Friday morning. Having served Republican and Democratic presidents, Gates is known for staying out of the political arena. His addition to the bipartisan list only served to underscore the alarm in national security circles following Trump’s punitive swipe at Brennan, seen by many as little more than an attempt to silence his enemies. But as usual Trump lives in a different universe. Leaving the White House for a trip to New York, Trump told reporters Friday he’s gotten a “tremendous response” since revoking Brennan’s clearance. He also blasted the special counsel investigation into Russian collusion and obstruction of justice as “a rigged witch hunt,” claiming that many intelligence officials involved in it should be under investigation themselves. “They should be looking at the other side,” Trump said. He singled out Justice Department official Bruce Ohr, the only current government employee whose security clearance the White House claimed Wednesday to be reviewing. Ohr was an early Justice Department contact of Christopher Steele, the private investigator whose dossier on the Trump campaign’s Russia connections was a cornerstone of the government’s initial investigation. Ohr’s wife also once worked for the firm that compiled the dossier. So stripping and threats to strip security clearances is about Russian investigation. On Wednesday, White House press secretary Sarah Huckabee Sanders announced that President Trump had decided to revoke John Brennan’s security clearance, citing the former CIA director’s “erratic conduct and behavior”. Oodles of irony in “erratic conduct and behavior””. Trump’s full statement on the decision explicitly mentions Brennan’s criticism of his administration as a rationale for it. Trump supporters do think that doing things like revoking Brennan’s security clearance and attacking Mueller and his investigation is taking decisive action against critics and against legal processes. And they parrot Trump’s lines about any criticism of his behaviour being part of some conspiracy – it was claimed by some that 300+ US newspapers denounce Trump attacks somehow proved Trump’s conspiracy claims rather than being widespread concern about Trump’s anti-media rhetoric, especially his tyrant-like promotion of ‘enemy of the people’. I don’t expect Trump devotees to stop their admiration, nor their defence of Trump. But there is obviously a lot of prominent people joining media in expressing their concerns about the petulant president who devotes a lot of time to attacking critics, attacking legal processes, and attacking his own judicial and security departments. I think it’s just a matter of time before Trump becomes known as the president who won the election but lost the war of words. He surely can’t keep making enemies of some many people and organisations and win the long game, when he is increasingly obsessed with daily skirmishes on Twitter. Trump is a twit who thought he could rule by Twitter – but he’s a dangerous twit will the Republicans keep aiding and abetting his dysfunctional and dangerous tenure. As has become normal, Donald Trump made a big claim via Twitter on Friday based on what appear to be nothing more than vague rumours. And as usual, this seems to have been somewhat embellished. Perhaps another investigation would clarify the extent of the FBI attention given the trump campaign, but it would also add another ring to the Trump circus. The drip feed of information about possible Russian collusion with the Trump campaign continues, but more is emerging about unsatisfactory FBI handling of issues over Hillary Clinton as well. It’s been 10 months since Washington learned that former British spy Christopher Steele, author of the so-called “Trump dossier,” took the Hillary Clinton-funded opposition research document to the FBI, which considered sponsoring the anti-Trump work at the height of the 2016 presidential campaign. Now, congressional investigators have made what is perhaps an even more consequential discovery: Knowledge of the dossier project, during the campaign, extended into the highest levels of the Obama Justice Department. Until August 31, 2016, with the presidential election in full swing, former FBI director James Comey gave the impression that he hadn’t arrived at his decision to let Clinton off the hook until after he had all the facts. Then, in early November, we learned that an early draft of that memo had accused Clinton of being “grossly negligent” in handling classified material because she used an unsecured private email server while Secretary of State. At some point during the editing process of that memo, “grossly negligent” became “extremely careless,” which is how Comey put it in the final version. The change was monumental. The criminal statute regarding mishandling classified material specifically cites “gross negligence” as a violation of the law, even if there is no intent involved. Had that language remained, Comey’s claim that “no reasonable prosecutor” would take the Clinton email case would have been laughable. Strzok, for those who don’t know, had been kicked off the Trump/Russia investigation this summer — a fact we also only learned about in the past few days — after it turned out that he’d been sending anti-Trump, pro-Hillary texts to an FBI colleague. The US looks badly broken, with no sign of a fix. 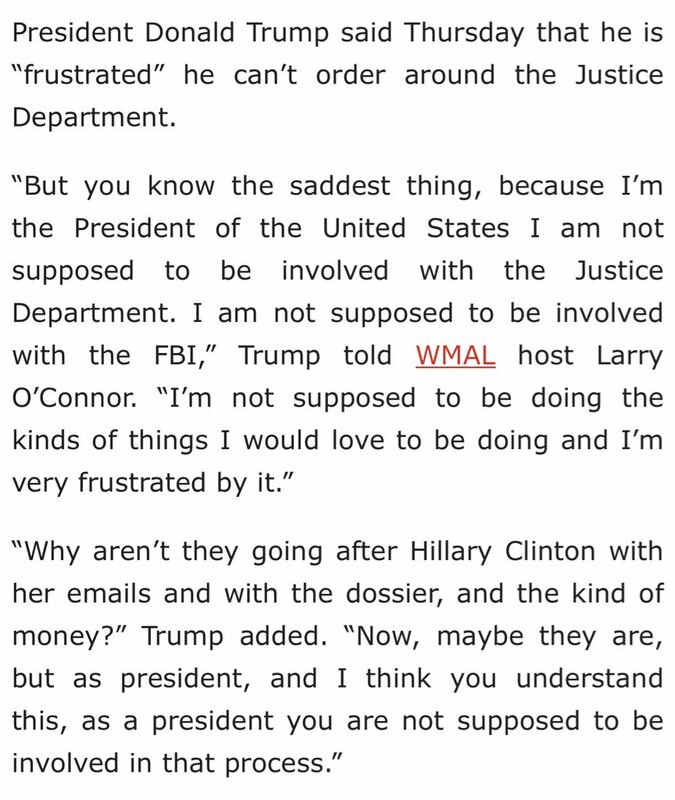 President Trump he is frustrated but sort of acknowledges that he shouldn’t get involved in what the US Justice Department and FBI do, but he still seems unable to resist. He has been particularly prominent in commenting about the investigation of his own campaign. It’s sad that the President even thinks of being able to demand and dictate to justice organisations. I’ve been thinking about these comments Trump made. What a fabulous tribute they are to the men and women of the DOJ and the FBI! The tribute is, of course, inadvertent: Trump doesn’t understand the statement he is making about independent law enforcement. But let’s unpack it for a moment. The President is saying that he would like to interfere in ongoing investigations. He is saying that he would like to order up investigations of his political opponents. He is announcing that he is a corrupt actor who does not believe in the rule of law. He is a man who is capable of firing his FBI Director because he will not aid him in these endeavours and to threaten his Attorney General and his Deputy Attorney General and the special counsel over the inconveniences they pose him. In these comments, he is announcing frankly how badly he wants to corrupt the Department of Justice. And yet, he is “frustrated.” Why? It’s not because of Jim Comey. He got rid of Jim Comey. It’s not because of Sessions or Rosenstein. Lordy knows they have not shrouded themselves in glory. It’s because the norm of independent law enforcement—which he is menacing—is actually strong enough to constrain him—at least right now. It’s strong enough that he can fulminate all he wants about investigating Clinton and still Mueller does his job, and the FBI does its job, and the men and women of the DOJ do their jobs, and none of their jobs, as our democratic polity has determined them, is to fulfill his undemocratic ambitions to loose investigators on people he doesn’t like and to have the Justice Department protect him. It’s a stunning statement of presidential constraint: A president actually saying that he aspires to corrupt interference with law enforcement and can’t pull it off. Let it warm your heart. It sure warms mine. But the attempts at interference continue. Prosecutors had requested a 14-year prison term following a week of emotional testimony from the survivors who were wounded during missions to find Bergdahl after he left the base in June 2009. Bergdahl’s defense team has asked for no prison time. In closing arguments, defense attorneys argued that Bergdahl already had suffered enough confinement during five years of brutal captivity by Taliban allies. They asked the judge for a dishonorable discharge and no prison time. Their argument for leniency also cited harsh campaign-trail criticism by Donald Trump and Bergdahl’s mental disorders. So Trump has been trying to interfere in this case since before he was president. He is still doing it as Commander in Chief of the Army and Navy of the United States. Because US justice officials appear to refuse to be influenced by Trump it is just futile posturing, but it’s a piss poor look for a President. Bernie Sanders gets it. First he gets a swipe from Trump. Bernie gets it. I don’t know whether it is deliberate attempts at distraction by trump, or that he is easily distracted from his job, but one could legitimately question who the crazy one is.